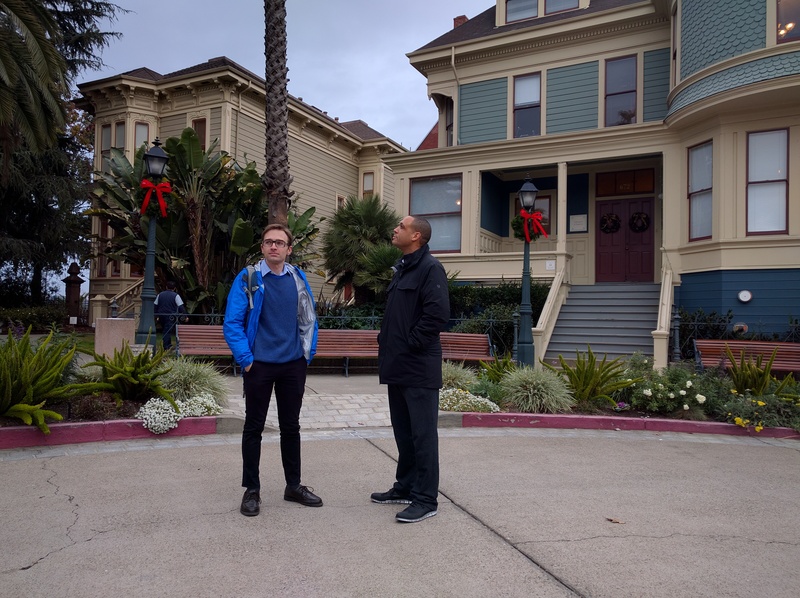 On a rainy morning in Preservation Park in Oakland, I met with Andrew Faulkner and Jonathan Fearn, advocates with “Connect Oakland,” to discuss their organization’s vision to remove the 980 freeway, which sits between downtown and West Oakland. “The 980 freeway was supposed to save downtown,” said Fearn. Instead, he explained, it became a 560-foot-wide asphalt moat, combining with the 880 and 580 to encircle West Oakland with wide freeways. 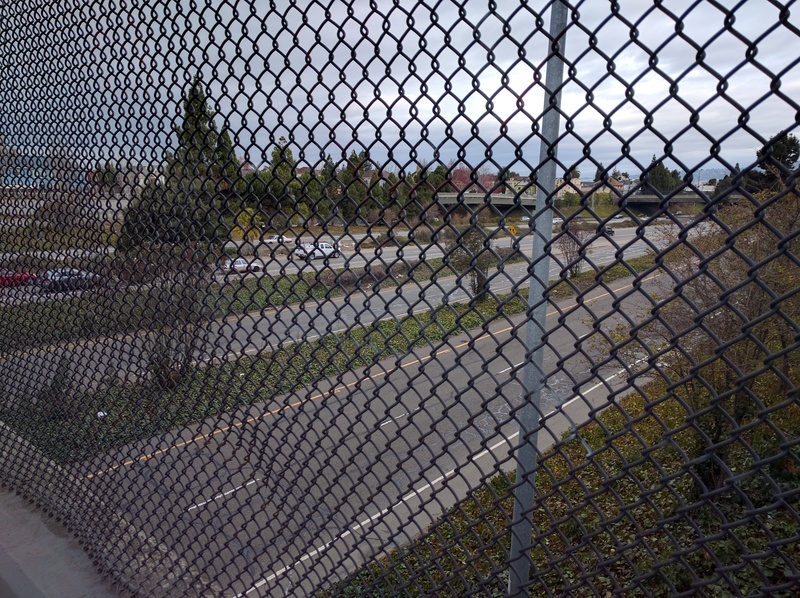 Fearn and Faulkner see connections between the highway and many of West Oakland’s problems. “It’s part of a larger pattern of dislocation and disinvestment in the community,” said Christopher Sensenig, an urban designer and founder of Connect Oakland. The freeway resulted from an aborted attempt to build a second bridge from Oakland to San Francisco. Even though the bridge never happened, the road that would feed cars to and from it was already in motion. All the planning to build the 980 caused investors to abandon the area. Advocates for the freeway then sold it as a way to invigorate downtown Oakland, by building a giant “glorified offramp,” as Faulkner called it, that would lead directly into parking structures. Such was the twisted logic and legacy of the highway-building era. Eventually, it wore down the anti-freeway coalition in Oakland, as advocates for the African American community, including the Black Panthers, bought into the idea and dropped their opposition, explained Faulkner and Fearn. The 980 finally opened in 1985. Meanwhile, preservationists fought to save the old Victorian houses in the freeway’s path. A handful of homes were moved to Preservation Park near the freeway’s edge. The rest were obliterated. Andrew Faulkner and Jonathan Fearn in Preservation Park. Looking at the surviving houses and walking along the banks of this freeway, I was struck by how the same pattern scarred cities across America. When I was growing up, my relatives bemoaned the disastrous impact of the Cross Bronx Expressway on their once great neighborhoods in New York. Building freeways between cities is fine. But the uniquely American decision to cut up and obliterate historic city neighborhoods and downtowns for massive freeway projects is difficult to comprehend. “America really went all-in with this idea,” said Faulkner. Faulkner, Fearn, Sensenig and other advocates with Connect Oakland are convinced the only cure for the 980 is to get rid of it. They point to the decision to remove the Embarcadero freeway in San Francisco and how that reinvigorated the surrounding area. Many other cities have proposed capping freeways through downtowns. But Connect Oakland said that would be too expensive and complicated with the 980. Instead, they want to reduce the footprint of the road dramatically, transforming it into a 132-foot-wide surface-level boulevard with bike lanes, trees, and sidewalks. The blocks that were destroyed by the 980 will be repaired. New blocks will be added. And a narrow section of the freeway gulch would be kept and covered to make space for a new BART and Caltrain tunnel that would eventually connect to the proposed second Transbay tube via Alameda. “The road carries 73,000 cars per day, making it one of the least traveled in the Bay Area,”said Faulkner. That level of traffic, he said, can be accommodated by the surface-level boulevard they’re proposing. And if the BART and Caltrain connection comes, the corridor will carry over 200,000 people. “We can triple the capacity with rail,” he said. “We just spent $4.6 billion on a new Bay Bridge eastern span and it’s already at capacity — and it has less capacity than it had in 1937, when it carried Oakland’s historic Key Car trains,” Fearn added. The idea is gaining support, including with Oakland Mayor Libby Schaaf. She has told Connect Oakland that “I-980 is a cautionary tale — a broken promise of a second crossing that remains a scar on our urban fabric.” The city has requested $5.2 million from the Alameda County Transportation Authority to study the conversion of I-980 into a second BART tube. “Removing the 980 is a no-brainer,” said Sensenig. Great report! The sad history of 980 is indeed part of a larger pattern of planning that affected most US downtowns in the second half of the 20th century. May Oakland continue pursuing a greener, cleaner and more equitable future for that corridor. Wonder which will come down first…980 in Oakland or 280 (at least the northern stretch) in SF. In the Los Angeles Metropolitan area, San Bernardino and San Diego, freeways are often referred to either by name or by route number (perhaps with a direction suffix), but with the addition of the definite article “the”, such as “the 405 North” or “the 605 (Freeway)”. This usage has been parodied in the recurring Saturday Night Live sketch “The Californians”.In contrast, typical Northern California usage omits the definite article. 280 in SF is not coming down. it was be an idiotic thing to do. This comment was be nothing to do with the story. No mention of 280 is made. They do mention the old Embarcadero freeway (which I’ve come to learn was called 480). But thanks for sharing your opinion about an unrelated item. How you you feel about socks? In general, I think it’s a fabulous idea, but it’s not clear to me that six car lanes are needed for a replacement. This could end up feeling like a mini-freeway. Mandela Parkway, which replaced the Cypress Freeway to the west of here, is mostly empty of traffic. Why not just rebuild ordinary standard width streets here and fully restore the old street grid? The i-980 is a valuable alignment for rail, especially if the idea is to bring Caltrain from SF to Oakland. Without the i-980 as an option, Caltrain wouldn’t be able to go to downtown Oakland (and connect with BART) and therefore would be far less useful. If the 2nd tube is BART only, there is no suitable location within the financial district area to put a station. A 2nd alignment in SF would also have to be quite long and expensive (as well as a location in SF to store trains) to be effective (yes there’s a vision of BART on Geary and down 19th Ave to Daly City, but that would require many more billions to complete). There’s no such issue with bring Caltrain to Oakland, and the i-980 alignment is wide enough to provide train storage. People can take BART to the new station, cross platform over the Caltrain, and ride direct to Transbay, SOMA, or further south. The purpose of the wide boulevard would be to continue to accommodate regional traffic going from 24 to 880 south. Personally, I’d much rather see regional traffic routed around downtown, rather than through it (I’m all for tearing it down all the way up to 27th). I think the better option for accommodating motorists going from 24 to 880 south would be the to build the missing ramp from 580 West to 880 South, but I have no idea if that’s possible, spatially. Reading “the 980” is jarring. When pressed about why I find it so objectionable I’ve come up with one good reason: People add “the” to things they think important. Around here if I hear a number prefixed with “the” I assume someone is referring to a bus line. Jimbo, you’re being a troll again! Remember we talked about this before when you asked why we think you’re being a troll? The removal of the underutilized I-280 over some of the most valuable and sought after property in California has absolutely nothing to do with this article. Bad Jimbo! Anything is possible, the question is it economically feasible. Wouldn’t it be great if we tore down 280 in SF? The part that split off the Portola and the Excelsior from the rest of the city. Not tangential at all. It’s an article about freeways in a Bay Area city that have divided neighborhoods. 280 fits the bill. We’ll do the usual. Wait until an earthquake makes it fall over. Being decisive is tough in our politics so we let nature do the hard work. No. It would make the traffic on the Bayshore unbearable. Beside, those neighborhoods were split off by the Southern Pacific tracks that used to run where the freeway is now. The new editor’s features have been excellent. Thank you for another interesting one, and thank you for covering East Bay issues. Pedestrians would have to cross 4(!) 2-lane roads. It’s so wide that services have to be duplicated on either side (parallel access roads in addition to the main travel lanes; two-way bike lanes on either side, space lost to medians between 4 separate roadways). This thing is just sprawl-y and bloated, and will discourage vibrant street life. Shrink it down to the width of east Grand Ave, dedicate 2 lanes to transit, and incorporate protected raised bike lanes. That allows for development lots to be much larger, bringing that much more revenue from land sale and taxes to the city. They’re surely more familiar with the complexities than I am, but I need to hear more about this. Because for me, the best of all scenarios is that we keep half the width of 980 as a buried tunnel preserving connectivity between 24 and 880; put the other half to use as a train tunnel; and redevelop the surface as above. Thanks for the map, but I wonder if the San Pablo alignment would be just too expensive. Alternatively, the Capitol Corridor already exists, so would be a far cheaper option. Perhaps Caltrain could come out the tunnel into a downtown Oakland station as you’ve mapped out, then backtrack when leaving the station, and head north along existing tracks. No expensive new connection required to Emeryville. and i was actually responded to SFhillrunner’s post, which was asking about 280. +1 to routing traffic from 24 to 880 south via a new 580 north -> 880 south ramp. The vision here should be to remove 980 without _any_ additional boulevard being added. If there’s concerns about local surface capacity, Brush and Castro could be kept as each 3-lane one-way streets. If you mean to reply to another comment, don’t start a brand new thread. 1) The only reason Jack London Square is currently important is because its the closest point between the Capital Corridor & DT Oakland. With a new alignment along I-980 there is no need for the Jack London Square stop. 2) The most sensible SF connection point is Mission Bay. A rail spur would connect with the new Transbay Terminal tunnel running down Townsend. BART would run up 3rd or 5th. The Jack London Sq station is proposed to support the urban development in that area, and to provide a direct connnection from the south with interfering with the Oakland wye. All the track connection to the existing lines would be at grade. The idea to take Caltrain to Oakland because Caltrain will serve downtown at TBT. 3rd or 5th street alignments are too far from the two busiest BART stations and are not effective to act as relief, and there’s also issue of station location, track connection to existing line (and if there’s no connection, train storage and light maintenance). The I-980 has space to store trains for Caltrain, and trains can continue south above ground south of downtown SF where space is available to store and service trains. If it is just BART only, not only you have the issue of where to store BART trains in SF, but also where to store Caltrain trains in SF. This removal of 980 proposal has been floated for years, and should just be quietly buried. John King over at the Chron did a couple pieces on it recently. This is a myopic look at a certain area which disregards the primary regional transportation aspect of the highway, which feeds Oakland airport and connects the east 880 corridor to Contra Costa county. Positive results of removing 980?… would be similar to what happened when the Cypress Freeway was removed. Nearly nothing. Go take a look at Mandela Parkway of you want to see the transformation that didn’t occur. At it’s root, the proposal is a thinly disguised attempt from developers to open up public land for private development. Connect Oakland was formed to kick this idea out many years ago, and it remains a short-sighted, small minded solution to a problem that doesn’t exist, but these urban planners just won’t let go of their pet project. 980 is one of the few efficient sections of bay area highways, which is a reason to keep it, not remove it and force 100,000+ vehicles onto surface streets, create more gridlock and pollution. Sensenig is the no-brainer! Routing the Capital Corridor through to I-980 will necessitate it descending sub-surface around Jack London Square (unless you propose knocking over a dozen buildings). The area around there already has ferries to downtown SF & is a short bus/walk to downtown Oakland. Realistically, it’s a small neighborhood on the water and will be “value engineered” out. Your argument re the two busiest BART stations is weak. A large number of those existing commuters are travelling east from Embarcadero & Montgomery stations to SOMA. In general, the growth in SF is to the East – SOMA & Mission Bay. These are the key areas to expand service to. Any new BART alignment will connect via Geary to 19th to Colma for storage/maintenance. Instant 200k+ new daily riders. This plan does not involve shifting of the Capitol Corridor. The Jack London Sq station is for BART only so it can connect with Caltrain at I-980 and perhaps extends to SF. Capitol Corridor only runs trains hourly at most and does not own its tracks. You can search the web that shows Downtown SF holds more jobs and therefore every Caltrain should serve TBT when it is extended, as supposed to operate some trains to TBT and terminate the rest at 4th & King. Considering that, why would we spend billions of dollars on a new rail tunnel that cannot provide relief to the existing tube? Extending Caltrain to Oakland basically allows the planned DTX tunnels and TBT to be better utilized. There’s nothing new about the Geary + 19th Ave alignment, but this is San Francisco and not People’s Republic of China. I don’t see that it is possible to have the 2nd tube, Geary, and 19th Ave to be planned, funded, and built in a single phase. If it is just the 2nd tube, you will need to include train storage, because there’s no timetable for the rest of the segment. 1) There’s no way out of the east side of the Transbay Terminal unless you reduce the length of some of the platforms. The plan right now is to have five 400m platforms, and one slightly shorter one at the north end of the station, due to the constraint of 201 Mission St. If you converted the two southernmost platforms to run-through you’d need to significantly reduce their length, which leaves only three 400m platforms. CAHSR have said they need four 400m platforms to operate at the terminal. It’s not an insurmountable problem – you could add two tracks and platforms under Howard St and use those as the run-through tracks instead, or you could just tell CAHSR to deal with having slightly less platform capacity than they asked for. 2) There’s no reason to build a second BART tube unless you’re actually going to use it. The plan should include a tunnel from the landing point to Union Square, heading west under Bryant, north under third, and west under Geary. This is technically feasible, would be a relatively minor additional cost, and would be the minimum required to make the new BART line usable. 3) You don’t necessarily need to build a BART yard in SF. You could instead build one in Oakland or Alameda and deadhead the first few trains to SF in the morning. Fremont trains are stored in the Hayward yard, and Pittsburg/Bay Point trains are stored in the Concord yard. Possible locations for a new BART yard would be the space vacated by I-980, or the old Alameda Naval Yard. A major benefit of removing the I-980 is to re-route the Capital Corridor closer to downtown Oakland. That can be done immediately – well before a second tube. Downtown SF *currently* holds more jobs, but the growth is happening to the east in SOMA. By the time a second tube is built (2 decades?) it will be one continuous CBD. I am a bit partial to I-280 in SF (given that 101/80 is congested with bridge traffic already. The I-980 outlived its usefulness, which was when after the collapse of the Cypress viaduct and before the relocation of the freeway. The alignment is valuable because it has enough land to bring Caltrain/HSR to Oakland. With immersed tube construction, it is possible to build multiple tracks as a part of a larger tube. There are examples of highway + rail tube around the world. This is different than say building tunnels with tunnel boring machines where if you want 4 tracks you will need 4 separate bores. So with this plan you can have a 4 bore tube built at once. The first of two for Caltrain will be activated first. The second two can be kept unused until BART segment in SF is complete, or used for buses, emergency vehicles, or Muni Metro. The concept is to phase-in the construction so it can happen over time. So if there’s political will to build a second tube, there should be plenty of capacity available. Extending Caltrain first adds capacity to Downtown SF without additional construction within SF. If and when SF can figure out how to finance another subway then the tube will be ready. The potential for Capitol Corridor to expand service is extremely limited due to UP ownership and slow alignment around San Pablo Bay. To become either high speed rail, or urban rail, a dedicated alignment will likely be required. Capitol Corridor is not like Caltrain and should not be compared to Caltrain. If something like extending Capitol Corridor to Downtown Oakland, it would likely require electrification, which itself is very unlikely because UP owns the tracks. A lot of downtown growth is happening around TBT due to sale of excess land from CA-480 and old TBT structure. If Caltrain is extended, it will serve the new developments well. This still doesn’t explain why you would build a four bore tube and only use two of the bores. The additional cost of extending the new BART line from the tube landing to Union Square is probably around $1.5bn, based on the (already hig)h Cetral Subway cost of $1bn/mile. That’s a minor extra cost compared to the cost of the tube itself, which will probably be closer to $15bn. And given than most of the people using the new tube will be East Bay residents heading to jobs in downtown SF, financing for that line should be a regional concern, at least as far west as Union Square. Muni Metro and buses should never cross the Bay in a tube that could instead be used for heavy rail. It’s simply a waste to run low capacity vehicles through a tube that could support higher capacity vehicles. Jack London Square is pretty much becoming a part of downtown Oakland. Re-routing the Cap Corridor would only slow its run times and make it less attractive. It already connects with BART at Richmond and Coloseum, getting your into downtown directly. If you want to just stay on the Cap Corridor there is a free shuttle from Jack London to downtown. If we are going to invest money in the Cap Corridor, I’d improve the SJ->Coloseum segment. You build 4 bores because all it needs is a larger tube structure and a slightly larger dredge under the bay. There’s nothing that requires construction workers to go back. The problem with BART is that I haven’t see any plans that it will serve the financial district, close to the two busiest BART stops. The plans that I have seen are inferior in terms of their station location, lack of identified train storage and track connection. 4 bore doesn’t preclude that, it just defers until a plan is identified, or until demand and development shifts. The two extra bores can be used by buses and emergency vehicles in the interim. The concept to extend Muni Metro is because Muni also serves the same 4 stops downtown. So extending it to Oakland will be very effective in adding capacity. If there’s sufficient turn back on the west side, you can run a multi-car subway type train on the same track as LRT. Also, by extending Muni Metro, you have the option to extend LRT further in the East Bay neighborhoods (essentially bring back the Key System) with surface rail. This is a 4 bore tube here so Caltain will be providing faster and higher capacity service. Why should it surprise anyone that there are developers involved? Connect Oakland is still touching on many issues that readers of this blog care about. 980 wastes a huge amount of space in downtown Oakland and it severs pedestrian and bicycle connections between downtown and West Oakland. As a piece of infrastructure, it’s inefficient and underutilized per the author’s data points on vehicle count. It’s an eyesore and a source of (even more) airborne pollutants in Downtown and West Oakland (in addition to the Port). Sure, it’s great to drive on, but overall it detracts from our city. And here, Connect Oakland presented a vision that addresses these issues while creating badly-needed housing in a walkable location, served by public transportation. Keep the proposal alive! Under-utilized? Wrong, as it carries approximately the same traffic as the Golden Gate Bridge. Severs pedestrian & bicycle traffic? Wrong, to cross over 980 the many streets are flat, level & smooth, because 980 goes UNDER existing streets. The pollutants would only increase if traffic was dumped onto the proposed boulevard. Big problem here is: urban planners lacking transportation planning skills. Oakland is not an Island. Hypocrite just a bit? Your partialness to 280 parallels how many others feel about 980. Removing it would increase congestion of 580/80 interchange and Bay Bridge access impacting other areas like dominos. A second transbay tube, or rail into Oakland, neither require removing 980. Oakland alone will never have the funds to do either – its a regional issue. As is 980. It’s not Oaklands’ pet area to dictate use of. My feeling is that I-280 is a better freeway alignment from urban development perspective. If somehow a connection is made between I-280 and bridge, then 101 could be narrowed or removed to free up land for transit and developments. I-980 is like the 101 where it is closer to urban center and land could be better used. The I-880 alignment does not divide the area same way. I think that whatever plan to remove I-980 should include improvements to the existing freeways to partially offset the loss of capacity. You complain that a (landscaped, grade-separated) freeway is a “gash,” but you’d replace it with a busy, at-grade street crossing — or a rail yard? WTF???? “Gash”? 980’s a grade-separated road; replacing it with a busy, street-level boulevard would be far more hazardous to pedestrians. Meanwhile, West Oakland is rapidly becoming a more desirable neighborhood — “gash” and all — to the point where there’s now endless kvetching about gentrification and “displacement” (as if the integration of a former monolithically black ghetto represents a loss of “diversity”). This is California. Stop trying to turn it into the Bronx. What thoughtful discussion! And fascinating that bay bridge capacity is lower now than in 1937. Anyone familiar with what capacity we could get out of the bridge with high-speed autonomous buses (which are synced and could travel even more densely than human-driven). With a couple dedicated lanes, and connections to autonomous vanpools and cars at either end, it could be a much faster commute than today, but am wondering if it could provide enough capacity to make a second tunnel unnecessary. There’s enough excess land to add rail in the sides and/or median of the current 980 alignment without eliminating or curtailing the freeway. Interesting plan..Though, I think that the Caltrain/Bart tunnel should also include high speed rail trains running through it, which would mean 2 extra tracks, along with letting Amtrak sharing Caltrain’s tracks to serve Transbay Terminal. There’d be 2 more tracks for high speed rail and 4 tracks for Bart. The 4 Bart tracks are there for added capacity which will be obviously sorely needed in the coming decades. I think that if it ran under 980, there should be a station at Grand ave served by Bart, high speed rail, Caltrain and Amtrak. A good block or 2 after Grand ave, as is shown on your map, Bart would split off to rejoin the existing trackage. While I think Caltrain and the high speed rail trains should go northwest and take the Amtrak right of way to Sacramento. Despite the fact what I’m proposing would cost countless billions of $s it’d be well worth it in the coming decades if it were built in the way I described it.